I'll be on vacation next week, and I intend to eschew glowing rectangles while I'm gone, so there won't be anything new here for a while. The BEA reports disposable income increased by $178 billion in May, while consumption increased $25 billion. In the textbook Keynesian framework, that implies an extremely small marginal propensity to consume of 0.14 (25/178). That, in turn, means a modest multiplier effect. While expansionary fiscal policy is still the right thing to do, a smaller multiplier means a larger stimulus is necessary to achieve a given increase in output. Another implication of incomes growing faster than consumption is an increasing savings rate. In May, the savings rate was 6.9%, which means we've quickly and painfully re-attained historically "normal" levels, according to this chart at Economix, after hovering near zero over the past several years. More domestic saving also means less borrowing from the rest of the world, which is reflected in a narrowing current account deficit. Turns out Warren County Commissioners will take the $1.87 million in stimulus dollars some of its members eagerly wished to return to the U.S. Treasury in April. The county leaders voted Tuesday to apply for the Energy Efficiency and Conservation Block Grant and use it toward a $13 million expansion of the Common Pleas Court building in Lebanon, a top-priority project this year in Warren County. The Congressional Budget Office (CBO) has estimated the cost of the Waxman-Markey "cap and trade" bill, and found that it is modest - about $22 billion ($175 per capita) in 2020. That is an estimate of gross costs, and does not take into account the benefits of reducing global warming. The benefits may be quite large. 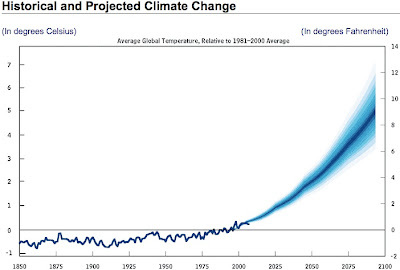 Separately, the CBO has analyzed the likely effects of global warming. Though they do not put a dollar value on it, $175 per year seems like a small price to (partly) avoid this: While there is some imprecision in estimating the exact implications of carbon emissions for the climate and the consequent economic costs, it is rational to pay small costs to reduce the probability of really, really, really bad outcomes. That is, in essence, why we buy insurance. Though I haven't (yet) managed to crash a car, it makes sense for me to write a check to a lovable, British-accented Gecko who will protect me from some the consequences if I ever do. In this case, the potential consequences are far worse than a car accident, and the costs of insurance are considerably less. I look forward to an exciting and rewarding academic year and ask you to join me in engaging our students in all facets of their Miami experience. Does that mean that we're supposed to join in on stuff like this? Personally, I'd prefer to stick with engaging our students in some facets of their Miami experience. So my first point is that the Obama administration's federal fiscal stimulus programmes are on the low side of what is appropriate by a substantial margin. This is the largest economic downturn since the Great Depression and the standard tools of expansionary monetary policy are tapped out and broken right now. My second, related point is that the need for federal-level fiscal expansion is reinforced by what state governments are doing right now. The federal government's discretionary actions are expanding aggregate demand by about $400 billion over fiscal year 2010, but state governments are right now cutting their spending and raising their taxes in order to offset this federal fiscal expansion more or less completely. On net, the government sector will be on autopilot as far as discretionary policy moves to stimulate the economy are concerned: federal-level expansion is offset and neutralised by state-level fiscal contraction. This is not an appropriate macroeconomic policy stance: this is the largest economic downturn since the Great Depression. The recovery from the Depression is often described as slow because America did not return to full employment until after the outbreak of the second world war. But the truth is the recovery in the four years after Franklin Roosevelt took office in 1933 was incredibly rapid. Annual real GDP growth averaged over 9%. Unemployment fell from 25% to 14%. The second world war aside, the United States has never experienced such sustained, rapid growth. However, that growth was halted by a second severe downturn in 1937-38, when unemployment surged again to 19% (see chart). The fundamental cause of this second recession was an unfortunate, and largely inadvertent, switch to contractionary fiscal and monetary policy. The 1937 episode provides a cautionary tale. The urge to declare victory and get back to normal policy after an economic crisis is strong. That urge needs to be resisted until the economy is again approaching full employment. Financial crises, in particular, tend to leave scars that make financial institutions, households and firms behave differently. If the government withdraws support too early, a return to economic decline or even panic could follow. In this regard, not only should we not prematurely stop Recovery Act spending, we need to plan carefully for its expiration. 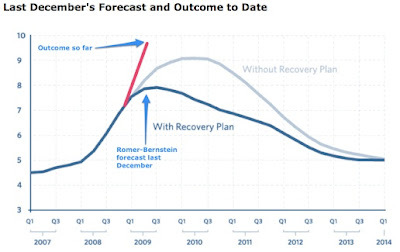 According to the Congressional Budget Office, the Recovery Act will provide nearly $400 billion of stimulus in the 2010 fiscal year, but just over $130 billion in 2011. This implies a fiscal contraction of about 2% of GDP. If all goes well, private demand will have increased enough by then to fill the gap. If that is not the case, broad policy support may need to be sustained somewhat longer. It sounds like she is laying the groundwork to follow DeLong's advice. That may be hard to pull off, politically, as Andrew Leonard notes polls show concern about the federal deficit (as they did in 1935 and 36, Krugman points out). The debate over economic policy has taken a predictable yet ominous turn: the crisis seems to be easing, and a chorus of critics is already demanding that the Federal Reserve and the Obama administration abandon their rescue efforts. For those who know their history, it’s déjà vu all over again — literally. For this is the third time in history that a major economy has found itself in a liquidity trap, a situation in which interest-rate cuts, the conventional way to perk up the economy, have reached their limit. When this happens, unconventional measures are the only way to fight recession. Yet such unconventional measures make the conventionally minded uncomfortable, and they keep pushing for a return to normalcy. In previous liquidity-trap episodes, policy makers gave in to these pressures far too soon, plunging the economy back into crisis. And if the critics have their way, we’ll do the same thing this time. 2009’s federal deficit is projected to be a larger percentage of G.D.P. (12 or 13 percent) than it has been any year since 1945, and yet a measly 5 percent of Americans are complaining that deficit/debt/budget issues are the country’s biggest problem. Long attracted to the safety of solid gold, Germans will soon be able to sate their appetite for the yellow metal as easily as buying a chocolate bar after plans were announced on Tuesday to install gold vending machines in airports and railway stations across the country. The venture by the TG-Gold-Super-Markt company, based near Stuttgart, aims to build on soaring retail interest in gold purchases after a loss in confidence in a range of other investments as a result of the financial crisis. That comes to my attention via Yves Smith, who says "you cannot make this stuff up." Update: More on this from the Times. [Council of Economic Advisors Chair Christina] Romer was joking, she said in an interview, adding, “There are only a few times that I felt like smacking Larry.” Yet few laughed in the president’s presence. 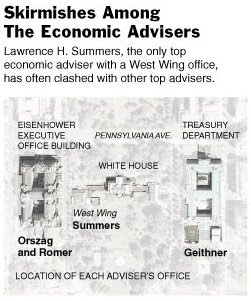 "Larry" being National Economic Council chair Lawrence Summers. Could it be that the other other members of the economic team resent the "brilliant but supercilious" Summers because he got a better office? That's what the graphic accompanying the article seems to imply: Of course, intra-administration battles over economic policy are nothing new... indeed, it would be strange if there wasn't any. TNR has a slideshow of the "Economic Feuds" in administrations going back to FDR. As Matthew Yglesias notes, the real question is who is leaking and why? The all-time classic of the economic advisor leak genre remains William Greider's 1981 Atlantic Monthly piece wherein David Stockman reveals the existence of the "magic asterisk." Time to End the Amenities Arms Race? When he talks about Reed’s short-term response to the recession, [Reed President Colin] Diver concedes that he is torn, wondering whether a broader reassessment would be in order. While I would attribute the increase in the relative price of higher education primarily to Baumol's cost disease, the positional arms race in amenities is no doubt an important secondary factor. Hopefully the recession will finally force a change in priorities. A.W. Phillips, who famously noted the relationship between inflation and employment that became the "Phillips curve," was also mechanically inclined... check out the Phillips machine, which models the stocks and flows of the economy with water circulating through a contraption of tanks, valves, pumps and tubes. For more, see also this Guardian article. I think the message is that foreign aid is cool uptown, but not downtown. Development aid booster Jeffrey Sachs (Columbia) and critic William Easterly (NYU) are at it again, and this time it's personal.... (Dambisa Moyo is in on it too; she used to work at Goldman Sachs, which is downtown... coincidence?). Mark Thoma has rounded up their exchange at Economist's View, and Easterly summarizes at Aid Watch. I am with the majority of students of aid who agree with both of them, yes both of them, on one thing they actually agree on: that aid has made a difference in improving people’s lives and that there ought to be more of it. You wouldn’t know that what they disagree about is not whether aid “works” but how aid programs should be designed and implemented – a subject that doesn’t get headlines but matters.